Herbet, IV, 1900, 306, (1969, 156), VI (Petits Cartouches), 24. COLLECTIONS: Amsterdam (De Jong and de Groot, 1988, 542.23). New York, 62.525, no. 18. Paris, Aa 175 Folio. LITERATURE: Kusenberg, 1931, 165, under F.H. 13. 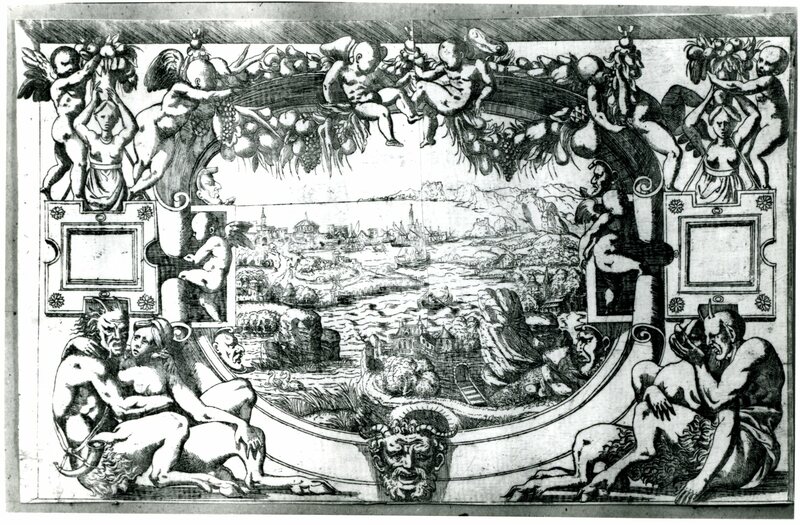 This etching is closely copied from Fantuzzi’s etching (Fig.E.63), in the same direction, that is related to the stucco frame planned for the lost Pavilion of Pomona. Du Cerceau has eliminated the landscape in the center. COPY: Moro. Cartouche with satyrs framing a scene with figures surrounding a seated man. Etching and drypoint, 12.8 x 18 P (Vienna). Bartsch, XVI, 1818, 90, 30, as Schiazone, in the same direction, but with a figured scene in the center. Herbet, II, 1896, 272-273 (1969, 68-69), under Fantuzzi no. 13, and IV, 1900, 302 (1969, 152), under Du Cerceau, V (Grands Cartouches), 9, and 306 (1969, 156), under Du Cerceau, VI (Petits Cartouches), 24. COLLECTIONS: New York, 26.70.3 (215) (State I), and (213) (State II, inscribed at the bottom center: Andrea Schiaon f.). Vienna, Vol. It.III.2, p.10, bottom left, State I (Fig.E.57,10, Moro), and bottom right, State II. LITERATURE: Kusenberg, 1931, 165-166, under F.H. 13, as freely copied from Fantuzzi. Zerner, IB, 32, 1979, 141 (Vienna, State I), as G.B. Pittoni? De Jong and de Groot, 1988, under 542.23, as Pittoni. Copied with variations from Du Cerceau in the same direction and with figured scenes added in the center and in the lateral squares. 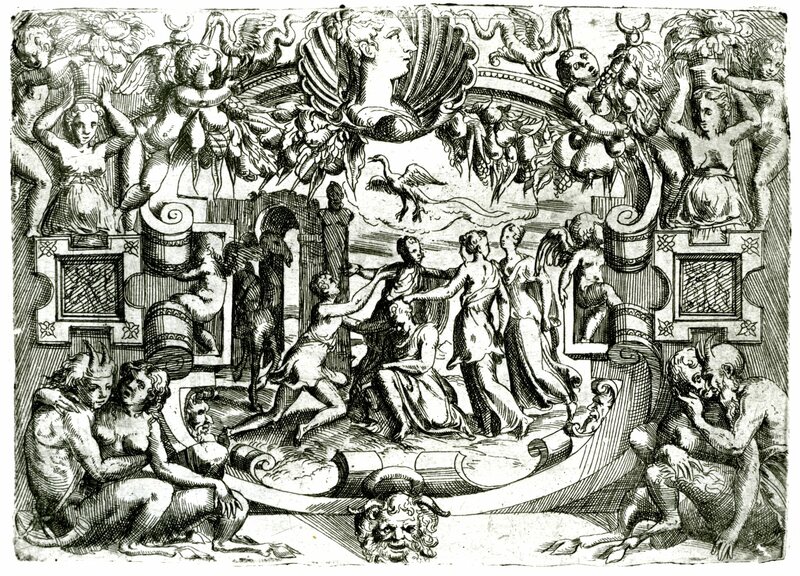 There is scrollwork above the head of the satyr at the bottom that does not appear in Fantuzzi’s etching but does appear in Du Cerceau’s Petit Cartouche. Moro’s print was copied in G.B. Pittoni, Imprese di diversi Principi…, Venice, 1562, pp. 4 and 6, etchings, the latter a fuller copy.